You'll never go on a real ale crawl in Solihull but this and the Assembly Rooms are the best of a very bad bunch. Well-kept beer, a reasonable clientele, service as good as the under-strength staff will allow. 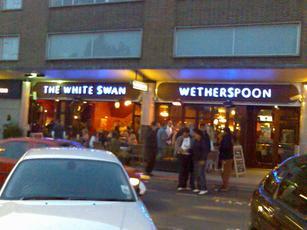 The old adage is proved once more - JDW are the best pubs in a bad town and the worst pubs in a good one. So this is where everyone is on a saturday afternoon. Having tried a couple of places and only had reasonable real ale (everywhere seems to think Hobgoblin is the answer) I decided to give this a go in the hope of a decent pint. It was absolutely rammed solid. Football on with text. Range of beers but I played safe and went for an Abbott - which was fine. Typical cavernous Wetherspoons that was half empty last night but livened up by the presence of one chap who walked in with his face fully covered by what seemed to be a woollen tea cosy wearing a tubular backpack device that looked as if it might be used for spraying weeds. Needless to say, he walked in unnoticed and proceeded to drink at the bar. The regular Abbot Ale and Ruddles Best were available as was the guest "The Hoard" from Walsall's Backyard Brewhouse but I tried Backyard's 6.8% Bad Santa, Purity's new Saddle Black, Jennings' Red Breast and the Old Hooky all of which were in good order and great value for their strengths at between £2.15-£2.30 per pint albeit a fraction cold for my taste. Nice friendly pub. great cider (Thatchers Gold) at a great price. Good staff make sure you don't wait to be served. Still a very decent JDWs. Have a manager that seems to have an enthusiasm for the beers which is a definite plus point..even had a free ale tasting session from local Midland breweries - all excellent.